Worship attendance matters. Learn how to improve it, so that your congregation bears more fruit. Our churches exist in order to glorify God and to share God as revealed in Jesus Christ. Thus, worship is at the center of the congregation’s life. And improvements in worship tend to spur improvements in the church’s other ministries. When a church’s worship is not vital, what happens to that church? Church leaders and laity know too well the dismal answer to that question. 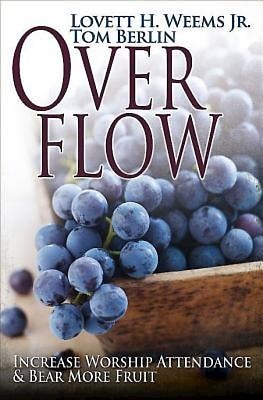 In Overflow, Lovett Weems and Tom Berlin share research-based insights and tactical ideas that result in improved worship attendance and in fruitful congregations. The authors identify practices that lead to increased attendance. They offer clear instruction, showing church leaders the areas where we must pay attention throughout the year, and demonstrating new ways to approach worship planning. Weems and Berlin present church leaders with another resource that is at once foundational and practical, convicting and accessible. Church leaders yearn to see more people worshipping God; Overflow provides encouragement and equipping to bear such fruit. Jesus promised that those “who abide in me and I in them bear much fruit” (John 15:4-5). Nowhere is this more important than in helping increasing numbers of people experience God through worship. At the heart of why any church exists is to glorify God and to share God as revealed in Jesus Christ; thus worship is at the center of the congregation’s life. The church, of course, is more than worship, but without vital worship attendance, it is unlikely that members are growing and new disciples are being brought to faith. Worship attendance is also the one factor where improvement tends to help every other aspect of the church’s ministry. There is another reason for focusing on worship attendance. After relatively strong attendance in the 1990s and a rise in attendance for five Sundays after the tragedy of Sept 11, 2001, attendance has been more likely to decrease instead of increase for most U.S. churches since 2002. Churches that grow connect people with God, and compelling and inspiring worship is a primary means of connection.